When you run a small business (i.e. less than 250 staff), it is important to get out to events to meet new people (potential clients/customers/suppliers, or just people to share ideas and bounce ideas off). We are a small UK business, we are a member of the Federation of small businesses and they organise various local events (which I shamefully have not got round to attending yet). So, this week, I attended an evening event which consisted of the chance to meet lots of people and attend a talk by the charming Denise Barnes. I have been to some truly horrendous networking events in the past, but I was very impressed with this one. Very little hard sell and the chance to meet lots of other local businesses and compare notes and discuss issues. There was a wide range of small businesses there but you will find that you have a lot in common. 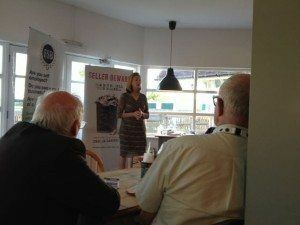 After coffee and chat, Denise Barnes (who used to run a local estate agents in the area) gave a talk about her misadventures in selling her business. She recounted the nightmare experience she had selling her business and all the mistakes she had made. Probably the most scary thing was the lack of sound advice she received from some very expensive so-called experts. As an estate agent who usually advises buyers to beware, she titled the book “Seller Beware“. It was also encouraging to see how she made the most of every opportunity, like finding herself sitting opposite Ian Hislop on a train. It was a very interesting talk, even if like me you have no interest in selling your business.